• In 1995 Alan Corry was asked to provide music for a concert in aid of Tor Bank Special School, Dundonald, to raise funds for the school and also raise public awareness of the school's role in the community. Alan made contact with a number of friends from various brass bands in the greater Belfast area and in September 1995 a group of approximately thirty amateur musicians performed for the first time as "Festival Brass", with Alan as their conductor. 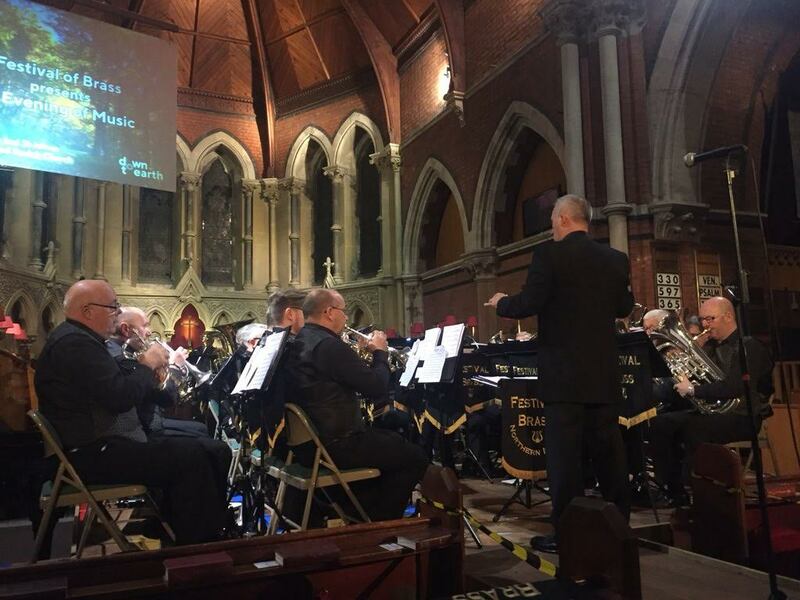 The concert, originally intended to be a one off performance, was a resounding success and a number of requests were received for Festival Brass to perform again. The members, encouraged by the success of this venture, decided to continue for the benefit of those in need. The band has raised funds in excess of £200k for various charities. • Festival Brass now perform on average six times a year, and have shared the stage with many well known artists such as West End stars Jeff Leyton (Les Misérables), Joanna Ampil (Les Misérables), Alex Sharpe (Miss Saigon), Carmen Cusack and our very own Peter Corry. • Festival Brass have also performed at music festivals in Spain on a number of occasions, as well as on a Mediterranean Sea cruise. Some of the concerts for 2019 are detailed below and on our events page. We look forward to meeting our friends who regularly attend our concerts, as well as some new friends. 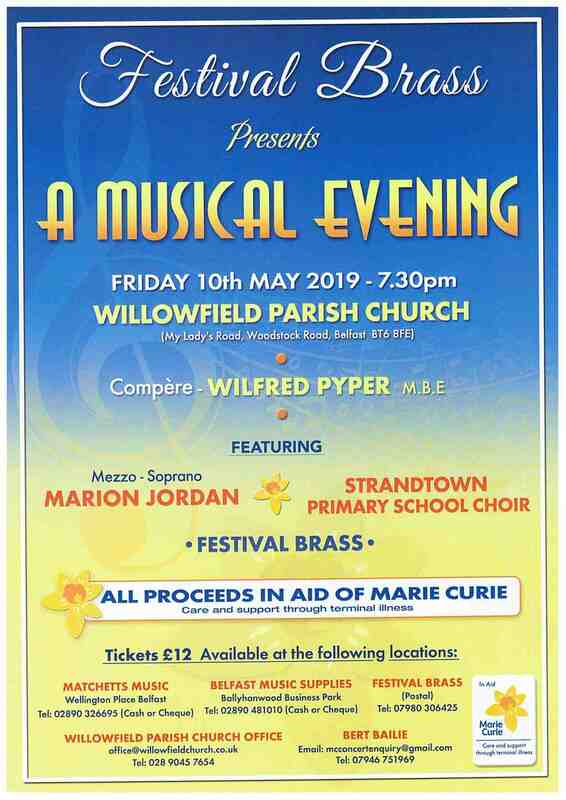 Festival Brass will host a concert in aid of Marie Curie in Willowfield Parish Church, Woodstock Road, Belfast on Friday 10th March 2019. Starting at 7.30pm our guests will be mezzo-soprano Marion Jordan, the choir of Strandtown Primary School and compere Wilfred Pyper MBE. The concert poster can be viewed in full size or opened for downloading by clicking here. 'A Musical Evening' - Friday 10th May 2019 at 7.30pm in Willowfield Parish church, Woodstock Road, Belfast, BT6 8FE. Festival Brass with mezzo-soprano Marion Jordan, the choir of Strandtown Primary School and compere Wilfred Pyper MBE. Tickets are £12 from Festival Brass (07980 306425) - postal only. Willowfield Parish Church office (028 9045 7654 or office@willowfieldchurch.co.uk). Bert Bailie (07946 751969 or mcconcertenquiry@gmail.com). Matchetts Music, Wellington Place, Belfast (028 9032 6695) - cash or cheque only. Belfast Music Supplies - Ballyhanwood Buiness Park, Dundonald (028 9048 1010) - cash or cheque only. Saturday 1st June 2019 at 7.30pm in the Riverside Theatre, Coleraine - Festival Brass with Ceara Grehan. Festival Brass is also embracing the latest social networking; to visit our Facebook page please click here. Festival Brass performing in Holywood parish church on Saturday 27th October 2018. Please keep a close check on this section for the latest information on upcoming events throughout the year. The section will be updated with as much information as possible as and when it becomes available. Within this gallery you will find a small selection of low resolution images from various events the band has taken part in.